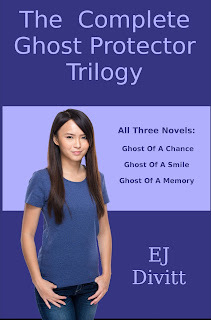 No one told Jenny Chang she is descended from a long line of supernatural protectors. When her father is murdered, the mantle of Protector passes to her. Suddenly thrust into the world of the dead and beholden to Zhong Kui, the King of Ghosts, Jenny struggles with new powers and new responsibilities. As she tries to find her way, Jenny must face an old evil that is loose in the world and uncover a secret buried in her family’s past. It's been months since Jenny Chang took over her father's job as supernatural protector. Being the Ghost Protector has already cost Jenny more than she thought she had to lose but now the stakes are higher than ever. Jenny's gotten used to helping spirits but can she help the living? Jenny will have to use all of her new found skills and abilities to face down her toughest foe yet. As Ghost Protector, Jenny Chang expected to find ghosts in her kitchen but the mother that abandoned her? Never. There is only one thing keeping Jenny from telling her mother to go to hell; her little brother needs her. Something is happening to Tommy that no one can explain. Can Jenny save her brother, face down an ancient evil and avoid getting killed or worse, fired, in the process? All three novels of The Ghost Protector Trilogy available in one collection. See Jenny's journey from discovering her powers to needing all of them to survive. Do you want to be more creative? Have you dreamed of being a writer? The best place to start is to write. Here are 365 writing prompts to get you started. Do one a day or as many as you like. Go through and do them one by one or flip through and pick and choose. You can start writing today. Do you dream of being a writer? Do you want to be more creative? This is the place to start. This book contains 366 writing prompts to help you get started; one for every day of the year including leap day. Do them one at a time in order or jump around and do several at once. Consider this a workout for your creative muscles. You can get started now. You want your wedding to be amazing. "I'm Engaged! Now What?" will help you be your own wedding planner and make your dream day come true. It's all a matter of planning and preparation. In these pages, you will find what needs to be done and when it needs to be done. It takes the guess work out of planning your perfect day and sets you on the path to wedding planning bliss. This edition also includes suggested planning and budgeting checklists as well as a list of important conversations to have with your fiance before you get married. Have you ever read Greek mythology? Athena, Artemis and Aphrodite were just some of the goddesses. They were incredibly powerful and beautiful; often petty and mistake prone. They were still goddesses. I have long believed that being a woman means we have the potential to be a force of nature. You are beautiful. You are strong in ways that most men do not even understand. You are a goddess in training. Full of advice and hints covering a variety of topics including self improvement, love, money, relationships and many more. Because being a goddess is not about being perfect . . .
Have you ever found yourself at a loss as to what to say to someone at a funeral? Been overwhelmed at the thought of writing a thank you card? You have good intentions but just need a little help? This book is for you. This is a short guide to etiquette in every day situations and special occasions including weddings, funerals and thank you cards. It includes an all new etiquette quiz with answers at the back of the book. Part of the "Things Every Goddess Should Know" series. A collection of short lessons and thoughts on a variety of subjects. Includes lessons on starting a fire, figuring out your net worth, learning to appreciate yourself and even surviving the zombie apocalypse. How do you handle a frozen pipe? Need advice on debt management, tax brackets and budgeting? Over 35 topics covered. Ever wondered about solar panels or if acts of God are covered by your home insurance? A series of quick essays on a variety of etiquette topics. Are you worried about how to behave at a wake? Is it okay to decline an invitation without giving a reason? How do you handle it when things get awkward? You'll recognize somethings that have irritated you in others and see topics you have not considered. Covers over 35 topics of everyday etiquette situations.